Okay, so the title is a big DUH! In any event, I had an opportunity recently to visit both Chicago and Las Vegas and to take some photographs. I decided to focus on architecture in both cities. These two cities could not be more different. 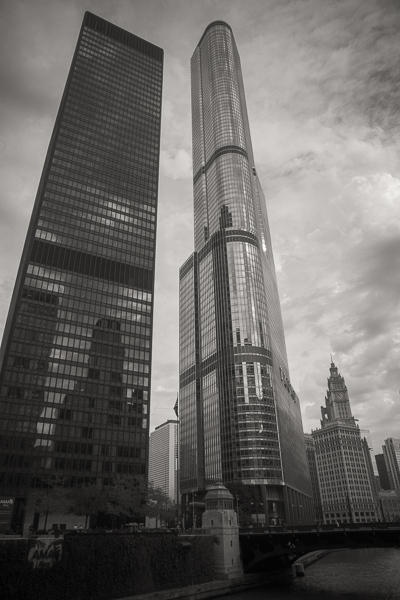 Chicago is filled with bold and imaginative high-rise buildings that feature stunning architecture and style! 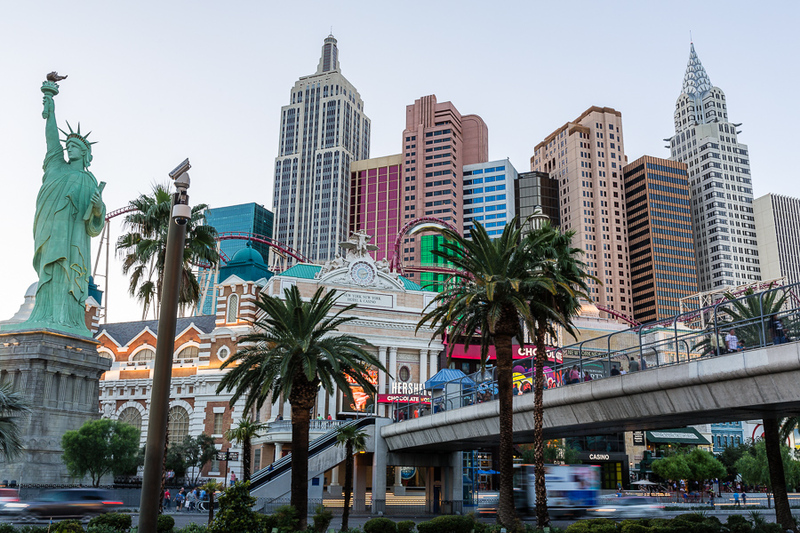 Las Vegas, on the other hand, is somewhat of an adult fantasyland, the architecture here focuses on creating the illusion of something magical and exciting in hopes that you won’t mind losing your money while you are gambling! The environment for both cities is also quite unique. Chicago hugs the shoreline of Lake Michigan, while Las Vegas is located in the desert. Chicago is a city of big business, big commerce and big industry. Many major corporations are either headquartered or have bases there. 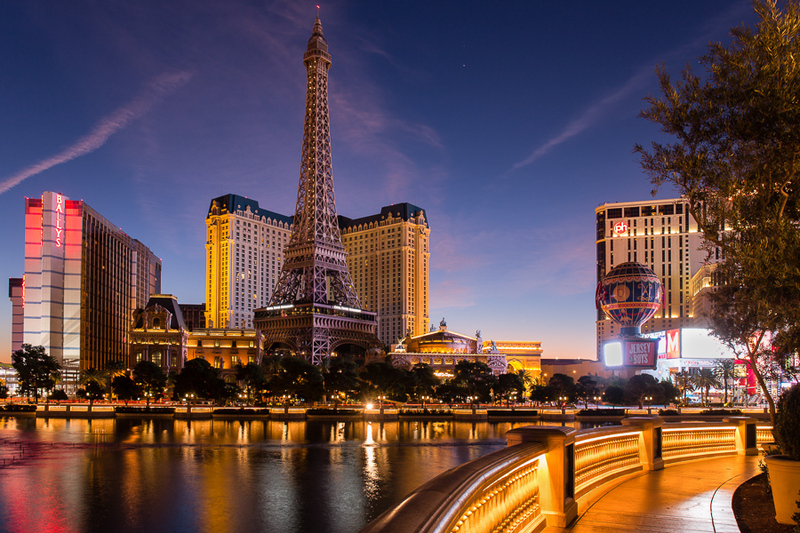 Las Vegas, is a city whose industry is hotels, casinos and visitors. In any event, both cities provided some great photographic opportunities. In Chicago, I did make an effort to try and take all of my photographs in the early part of the day to take advantage of some beautiful blue skies and white clouds. One of the photos in this post features two towers, the tower on the left is black and the tower on the right is a bright silver. The reflective surfaces created a lot of glare. The sky was somewhat dark so I decided to process this photo as a monochrome image. Trump Tower is on the right. The next photo was in the shadow of the Chicago CTA (subway) “L” train, with the iconic Trump tower in the background. My vantage point for this photo was standing in the street near the curb trying to avoid being hit by a car, truck or bus! When I uploaded this picture to my computer, I was initially disappointed in it because most of the picture was in heavy shadow. Fortunately, Adobe Lightroom’s shadow slider opened up this picture considerably along with the use of the Tone Curve tool. The lighting was somewhat tricky, but it created what I think is a good photograph. You can be the judge of that yourself! 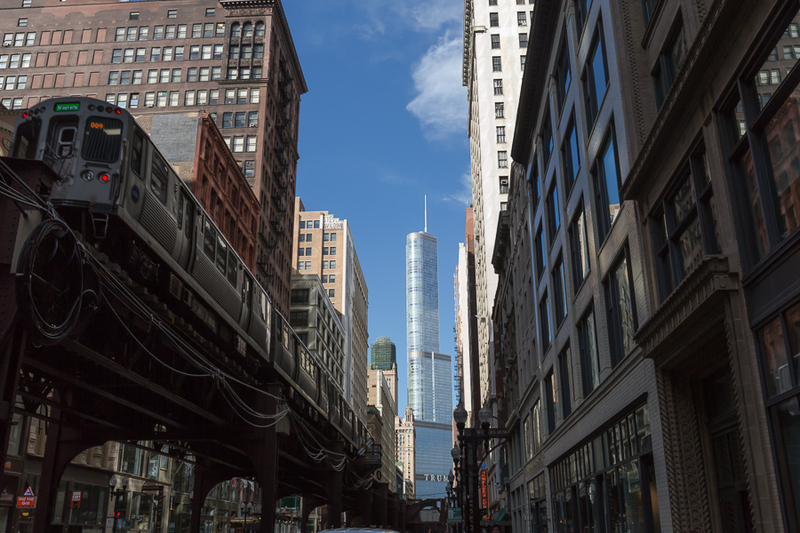 CTA’s Elevated “L” Train with the Trump Tower in the background. One of my favorite photos of this trip is titled Diving Platform. When I first saw this building I thought “Now that is a photograph waiting to happen!”. The sky was blue as was the tint of the building. The issue was where to stand, so I tried several angles. The best position was standing as close as I could and pointing the camera straight up and using the tree branches to enhance the photo. Since it was the middle of the day, many people passed by, some looked at me with a little curiosity but most just ignored me! Building across the street from the Sofitel Hotel. Photo shot at midday. I also took quite a few photographs that featured highly contrasty, bright skies and therefore the resulting photographs were not very good. So I didn’t post them to hide my lack of photographic skill! I had the opportunity to see firsthand how important the correct light actually is, even for shooting in the city. I did some sunrise photography in Chicago and I was quite pleased with those pictures, but I decided not to post them in this blog in order to be brief. Las Vegas, because of its location in the desert, the skies are extremely bright during the day and generally speaking clouds are somewhat limited. This definitely makes it difficult to take daytime photographs of the buildings along the Las Vegas strip. I did attempt to take one photograph of the New York New York Hotel and Casino which I posted in this blog. As you can see, the sky is quite boring and lacks any interest. I had to use the graduated filter in Adobe Lightroom to lower the exposure just to make it a presentable photo. Under the category of people say weird things, I’m sure the following situation has probably happened to you. As I was standing with my camera mounted on a tripod and pointed to the New York New York Casino, not once, but on several occasions people asked me what was I doing? I smiled and fought the urge to say something really sarcastic and merely replied “I’m taking a photo of the casino”. Shot in the late afternoon from the MGM Hotel & Casino Sidewalk. One of the benefits of being in the desert were the clear skies. I decided to take advantage of this by getting up at 4:00am the next morning to take some photographs. The Paris Hotel and Casino was situated in a favorable spot to catch the first glimpses of dawn breaking. I set up my camera across the street from the hotel, interestingly enough in front of the beautiful and very photographable Bellagio Hotel and Casino. The reflecting pool that you see is the pool that contains the famous water shows that the Bellagio is known for. This photo is another example of taking advantage of light, both the manmade light from the casinos and the light from the early morning sky. The photo was processed in Adobe Lightroom and Nik software’s Viveza 2 helped to brighten up the Eiffel Tower. Shot at daybreak from the Belliago Hotel & Casino sidewalk. 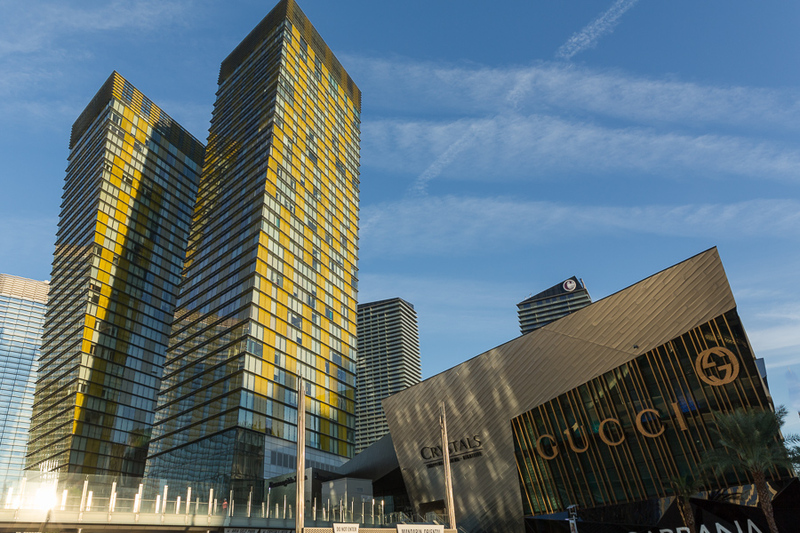 A little later that morning, I walked up Las Vegas Boulevard to the new Aria Hotel and Casino complex. Near the hotel are two very unique condominium towers along with an upscale shopping mall. The towers are unique in that they are actually built to look as if they were leaning in opposite directions. I took several shots from different positions because each time I peeked at the LCD screen the buildings tended to look straight! Finally, as I stood at the edge of the street corner in harm’s way, I got the best angle for the shot! Again, the early morning sky helped to make this an attractive picture. Later in the day, the sky was much too bright to take the same shot. Aria Condos and Shopping Mall. Shot in the early morning. These towers really are tilted its not the camera! So what have I learned from all of this? Besides the fact that I needed my wife to watch out for traffic as I took pictures, that lighting really is important. 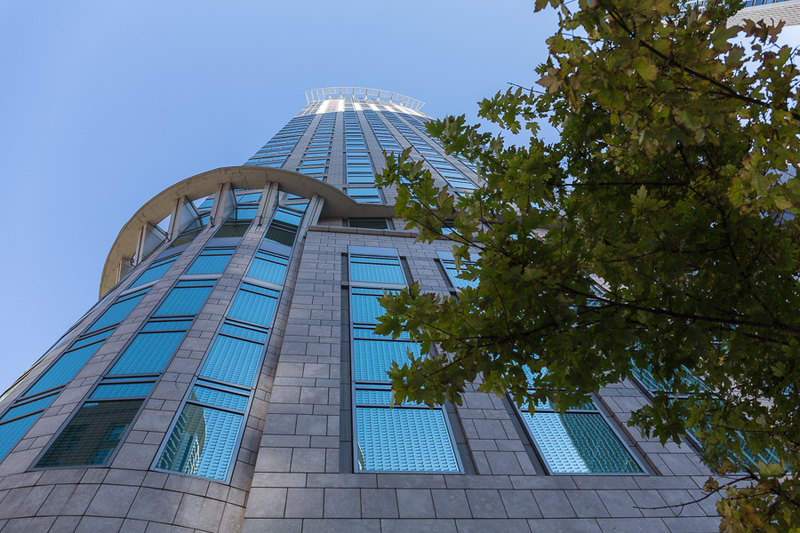 Another thing I learned, is if I am going to take a lot of pictures of tall buildings, I may need to invest in a tilt-shift lens to correct the distortion caused by a regular lens in this situation. As I have said before, this blog is not intended to teach anything because I don’t have enough skill as a photographer to take on that task. This blog is my attempt at documenting my experiences as an amateur photographer. Do any of you amateurs have an experience to share with shooting cityscapes? Let me know by leaving a comment.